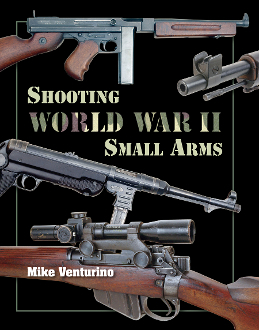 New from Mike Venturino, Shooting WWII Small Arms is a must-have for those interested in the vintage battle rifles of WW II. Even if you don’t have an interest in vintage battle rifles, this excellent reference work will likely kindle a desire to at least own one of these great old firearms. History, loads, personal observations... Mike’s life-long research is presented here. An outstanding hardcover volume, 328 pages, excellent color photograpghy, as well as many vintage photos; Shooting Small Arms of World War II is a class act.